A gorgeous day, hot and sunny. What a change! We drove north on I-95 to Canada’s Route 2, then headed east for an hour or two. There were lots of trees and an occasional pond or river, but it wasn’t an exciting day. Freeways rarely are. We did get a hazy view of Mt. Katahdin from 50 miles or so away. That was fun. It’s a beautiful mountain, aside from the memories we retain of climbing it. We decided to camp at a provincial park next to a large reservoir in the St. Johns River. We were early enough we were able to head up a trail out of the campground and walk in the woods for an hour and a half. It was a pleasant hike. Most interesting was the trail under the Treego, a ropes/zip line course in which people walk high above the ground through an obstacle course of sorts. It looked like fun. I’m happy to finally be in Canada. I’m a bit concerned because time is limited and there are simply too many options. My knowledge of the area is pretty limited since we didn’t have time to do a lot of research before we left Maryland. 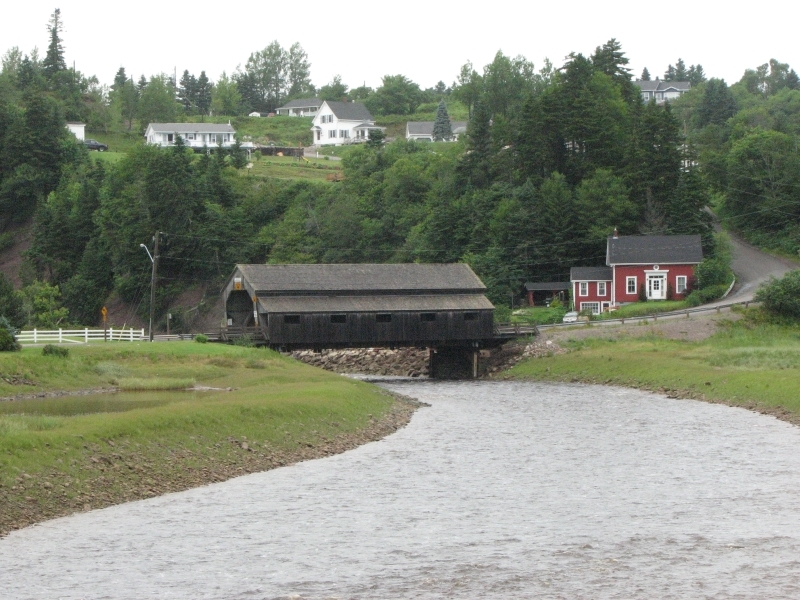 We decided to confine our visit to the Atlantic Maritimes: New Brunswick, Nova Scotia, Newfoundland and a bit of the Gaspé Peninsula in Quebec. That’s a lot of country. 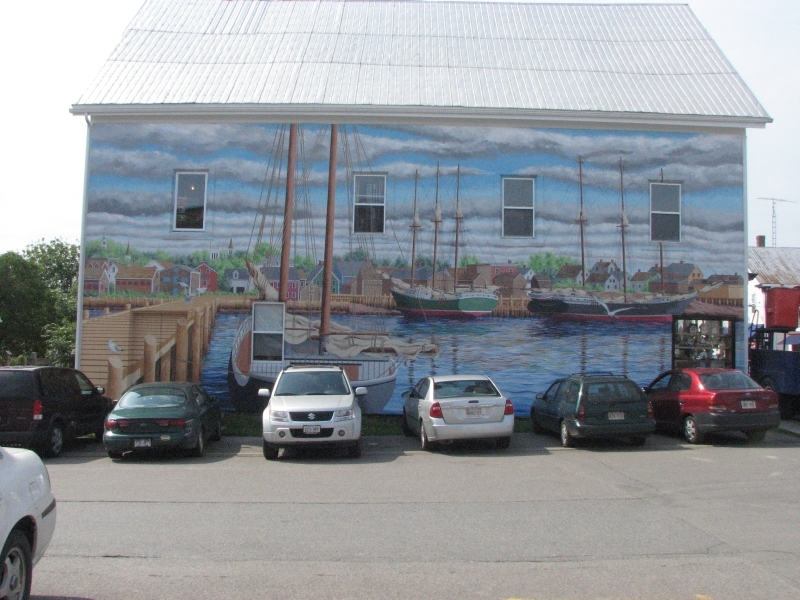 We have to be back in Maine in early September to meet my father who will be vacationing there. I’m not sure exactly how we’ll end up spending the next two months, but I’m sure we’ll have fun wandering, seeing new places, and experiencing the Atlantic coast for the first time. The maps show various scenic routes that are described in tourist guides available at the Visitors Centers, so at least we have a basic framework for our trip. I always enjoy following the scenic routes. 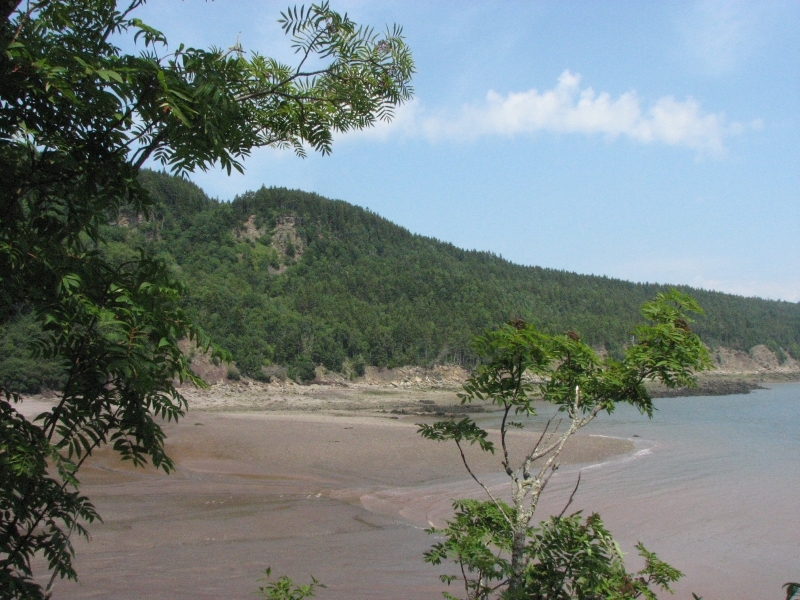 The Maritimes have a lot of beautiful beaches and there are several National and Provincial Parks that will give us a taste of the wild country that we both love. We woke to blue skies and sunshine – happiness. 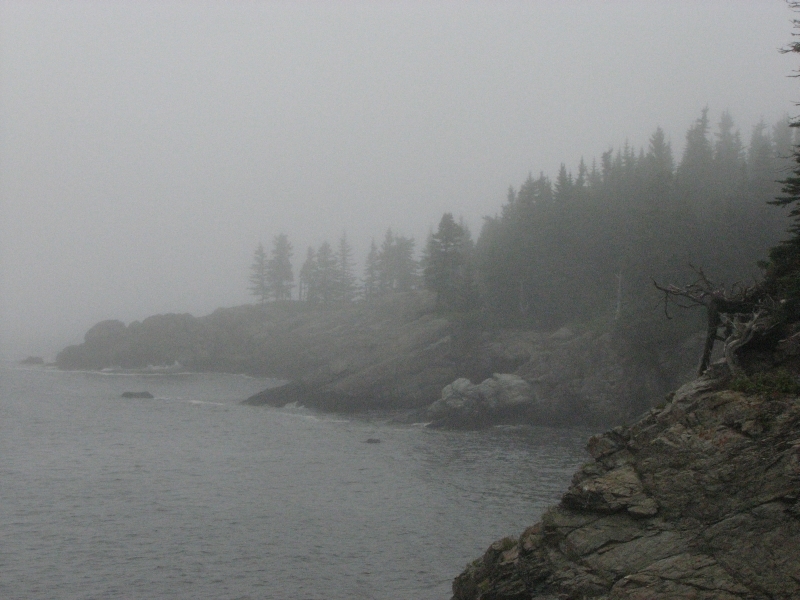 Unfortunately, as soon as we approached the coast, the sunshine vanished in a thick fog. 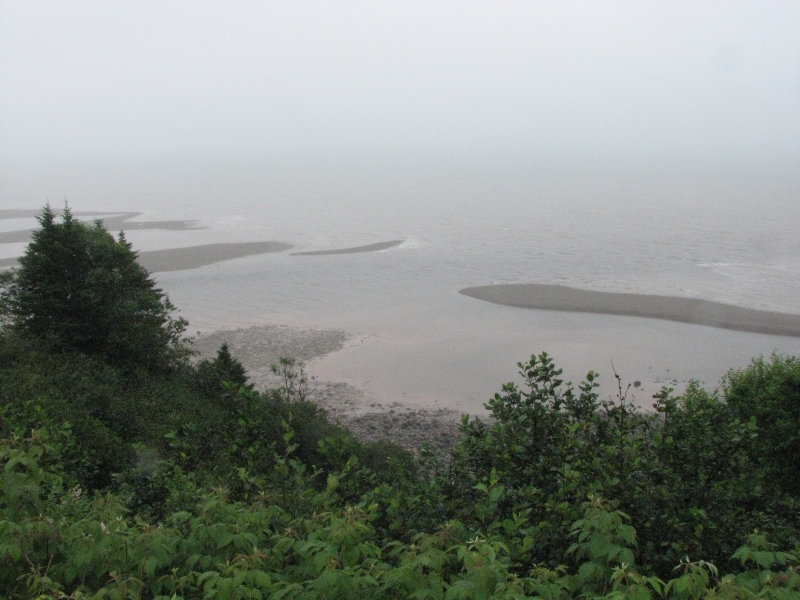 I enjoyed the drive along the St. John River (even our wrong turn out of the campground) but we were a bit disappointed when we reached Highway 1 along the Bay of Fundy to see that the road doesn’t stay close to the shore except in spots. We detoured to a couple of fishing villages. I was surprised at all the lobster pots neatly stacked up beside the houses. Why aren’t they in the water? (Turns out it is past the end of lobster season here.) It was low tide, so we got a glimpse of one extreme in the bay. Fundy is notorious for it’s extreme tides, caused by the shape of the bay. 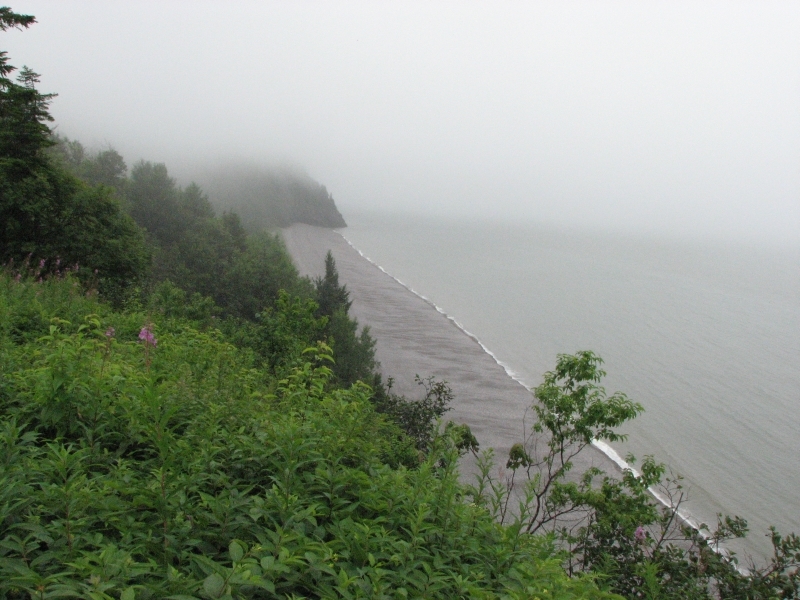 We stopped at New River Beach Provincial Park to get a campsite. There were plenty of empty spaces, thanks to the weather. The primitive section is very primitive, just an outhouse and no running water, but the sites are in the trees and it is very quiet, aside from the highway noise. 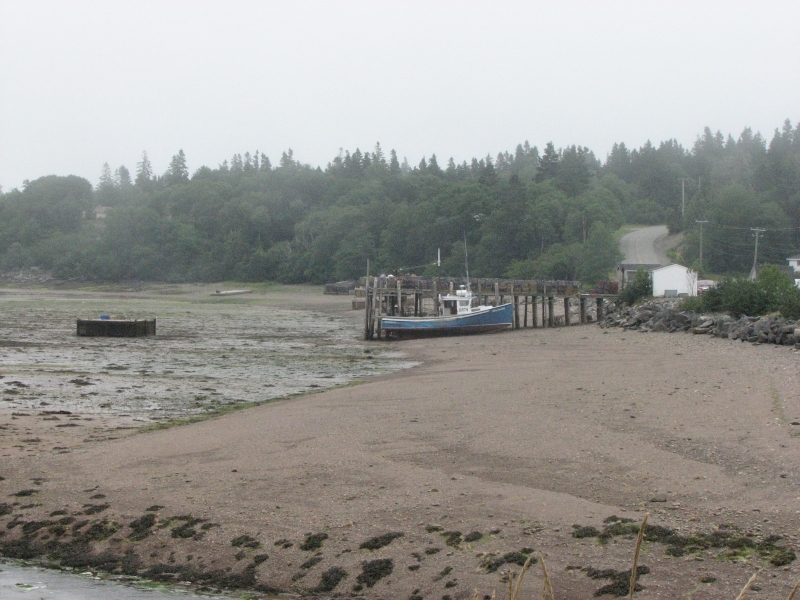 We drove to the town of St. Andrews and emerged from the fog bank. I had hoped to do a whale tour, but the afternoon boat was full and the forecast for tomorrow calls for rain, not ideal whale watching conditions. Actually, the whales don't care about the rain, but it's hard to get good photos in a downpour. We walked up and down the small downtown area, ate an ice cream, then returned to the campground and the fog. 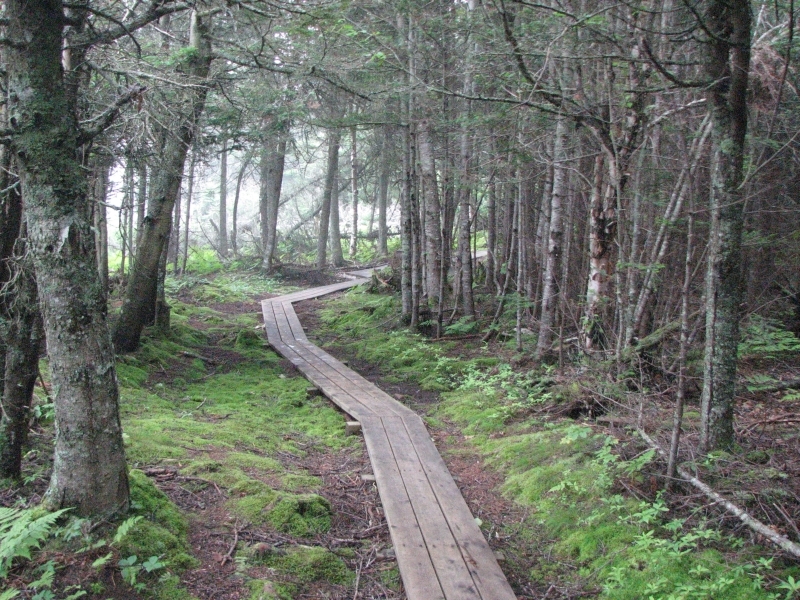 I wanted to hike the three mile nature trail along the shore and through north woods bog. Although the fog was dense, it was still an enjoyable hike. There was a lot of boardwalk covering much of the soft wet rooty trail. We could hear the tolling of a bell on a buoy and the occasional hoot of a foghorn. The restless murmur of the incoming tide accompanied our steps. We had the trail to ourselves--most people are too smart to be out in the damp--but I really enjoyed it. Since we were wet, Jim suggested dinner at a nearby seafood restaurant with a great view out over the water. The haddock was very tasty and we dried out quickly in the warm room. All in all, it was a good day. The forecast was correct, it rained. Breakfast time was only a bit misty, but soon after we left the campground (after jumpstarting a neighbor’s battery), it began to pour. All I really wanted to do was to hole up in a motel somewhere; instead we drove to St. Johns and visited the Museum of New Brunswick. It wasn’t a great museum, but it was warm and dry. A little after noon we headed to the village of St. Martins which has/is a Booktown. I assumed that meant it had a large bookstore, but no, it means that many of the town businesses, like restaurants and inns, sell new or used books. One of the shops was a damp garage crammed full of used books. We didn’t buy any there (though we looked) nor did we visit any of the other businesses since it was pouring rain. 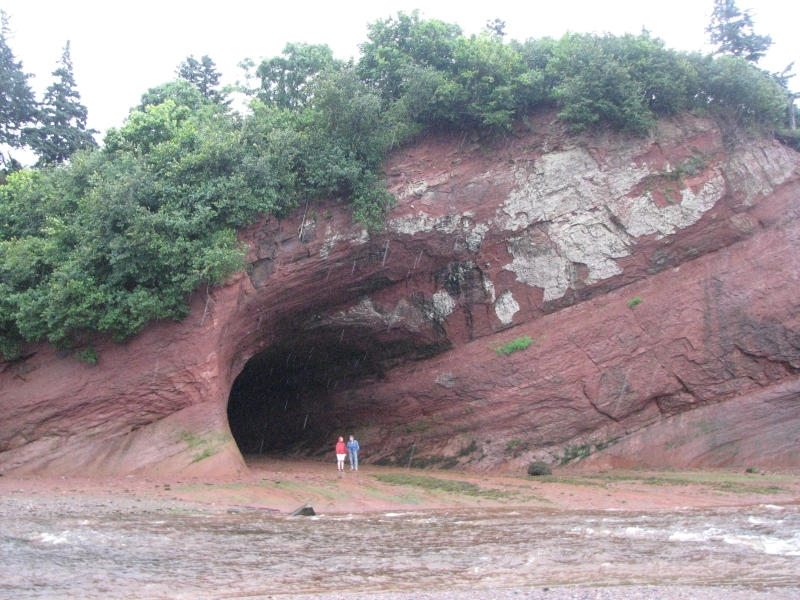 Just outside the harbor, we found St. Martin’s caves, which are shallow sea caves carved in the red rock by the waves. During low tide the caves are well above the water, but during high tide the caves are filled. 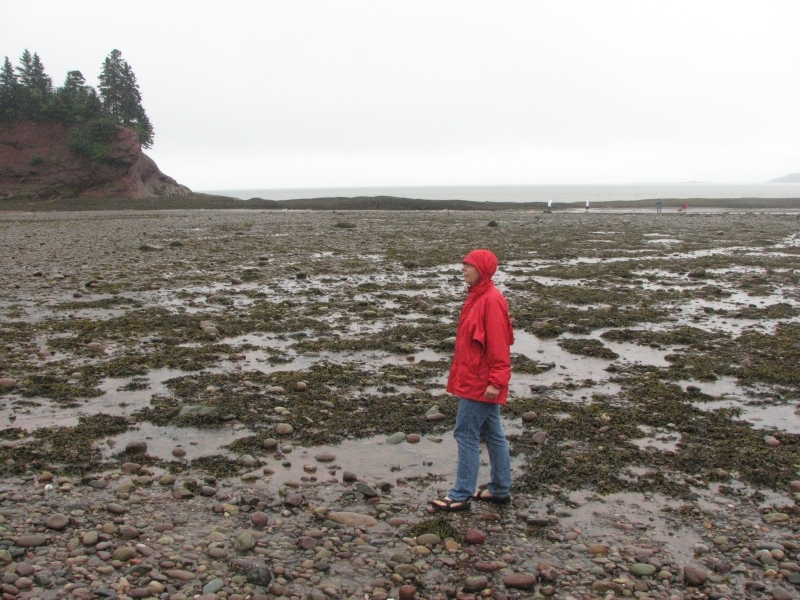 We arrived about an hour after low tide and then passed through again about three hours later and saw the difference. 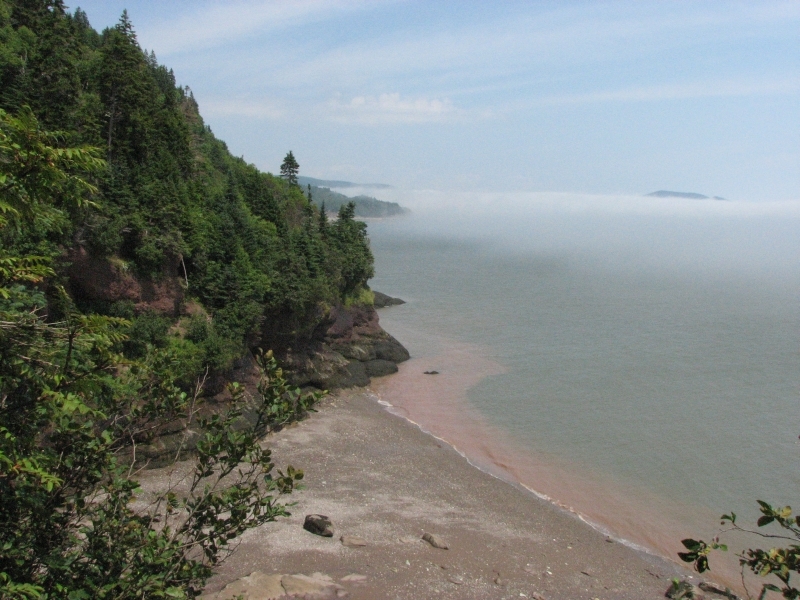 The Fundy Trail is a park a few miles away that consists of both an 11 km. scenic drive and a hiking/biking trail along the cliffs to the site of a former logging town. It rained all the way out to the Visitors Center, but while we were watching the video there, the rain ceased. Unfortunately, that didn’t help visibility much since the rain was replaced by fog. We stopped at a couple of overlooks but didn’t get much in the way of views, just a glimpse of steep rocky cliffs and pristine gravel beaches far below. 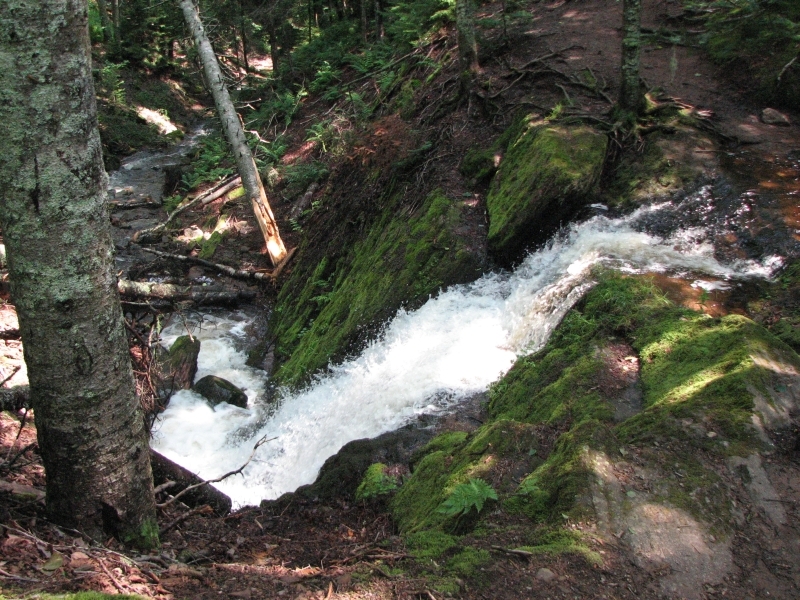 We walked down a cable staircase to dramatic Fuller Falls – a roaring torrent today – then I continued along the bike trail for a couple of miles through lush green forest to another parking area where Jim was waiting. The forests here are beautiful, with soft moss and lichen, sweet smelling ferns and a wide variety of deciduous and coniferous trees. It was a wet walk, especially when I left the bike path for a side route to see the Flower Pot: a 50’ rock formation topped by trees and mosses. There wasn’t any more rain, just light fog, but the flowers and grasses were drenched and soon, so was I. The drive from St. Martins to Sussex was a beautiful one past green fields with grazing cows and lush tree-covered hills. It felt very wild and remote. 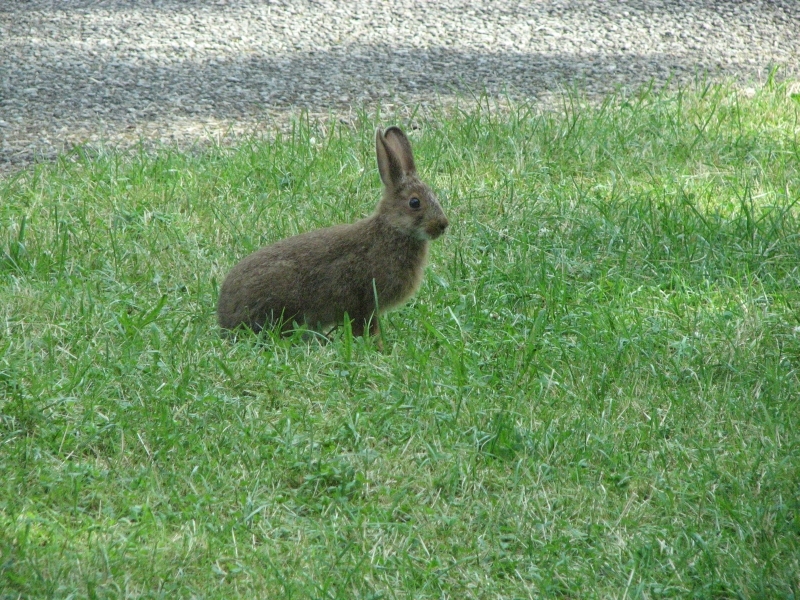 I even saw a deer, only the fourth one I’ve seen in the past month. We ended up stopping at a private campground near the highway a few miles from Sussex. 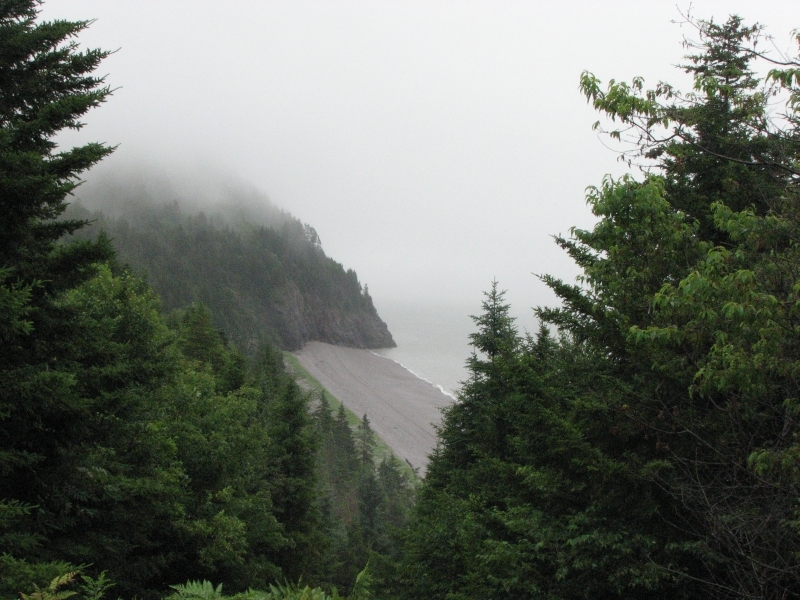 I wasn’t sure about getting a campsite at Fundy National Park so late in the day and I didn’t want to rush through the Park to find one someplace beyond there. The private campground was more expensive than the ones at the Provincial Parks, but the sites are flat and the shower hot, so I’m happy. 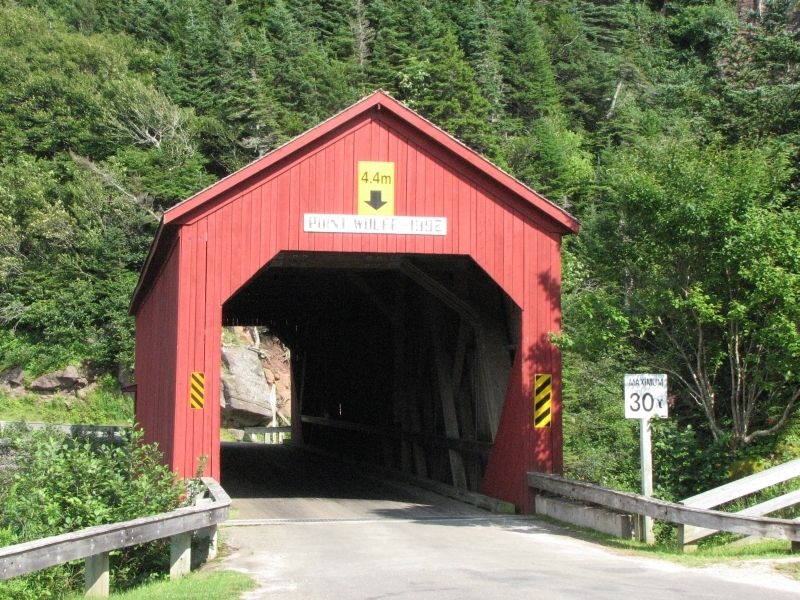 It was a beautiful sunny day as we drove the short distance to Fundy National Park. 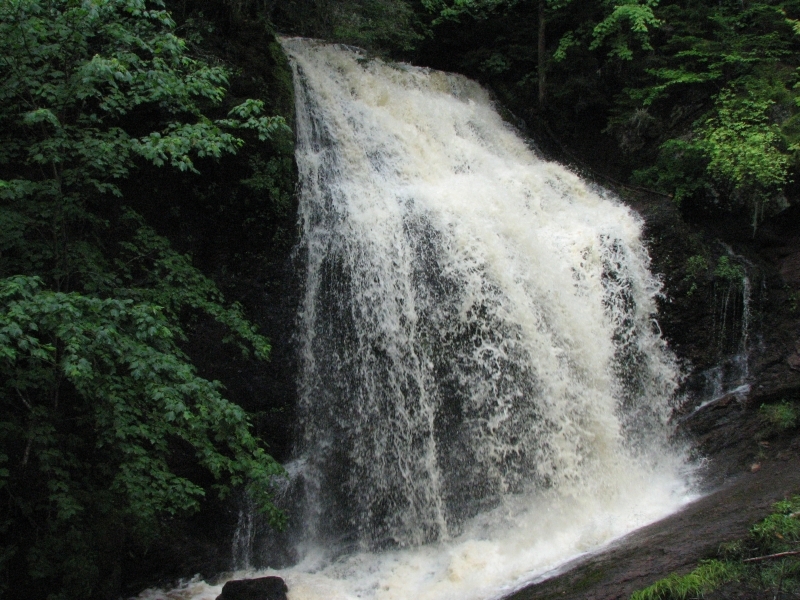 The park is known for its many hiking trails, some through the forest to lakes and waterfalls, others along the coast between Herring Beach and Wolfe Beach. 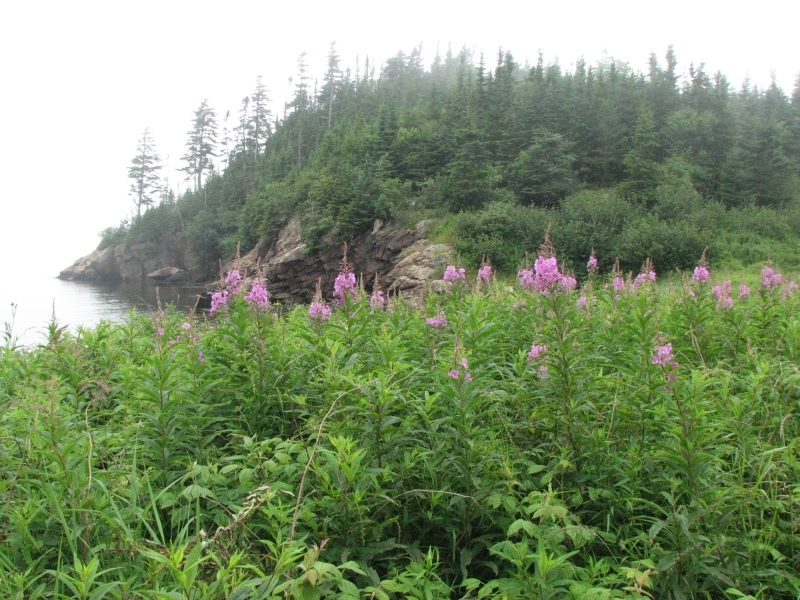 We started by getting a campsite at Wolfe Point Campground, then drove to the Herring Beach Trailhead where we followed the Coastal Trail to Matthews Head Trail, then looped back via the road. 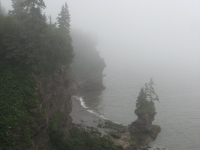 It was a nice hike with some good views of the foggy coastline, as well as a big waterfall and several small ones that dropped from the cliff tops down to the sea. The trail was very wet (it could use some waterbars) and steep in spots, but overall it was enjoyable as we wandered through the cool forest. 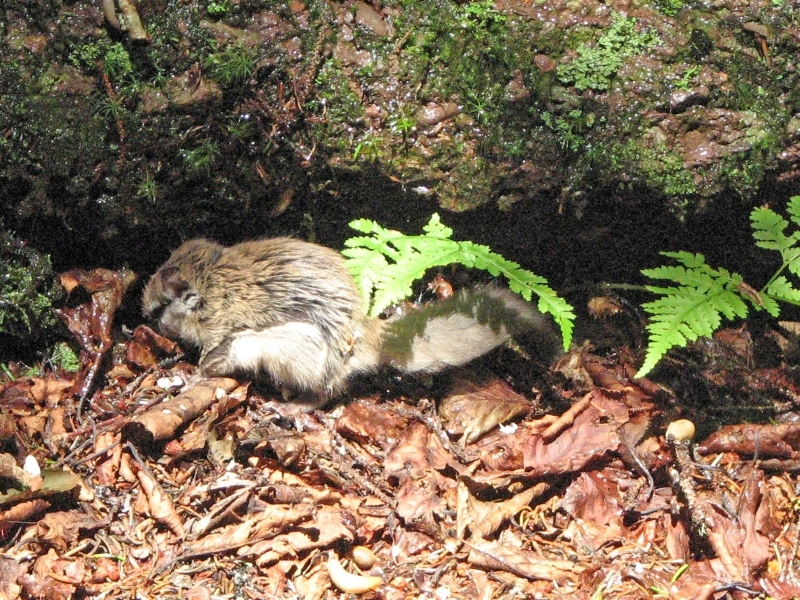 We saw a little animal--probably a flying squirrel--that was digging in the pine needles on the trail, ignoring the passing hikers. Afterwards we went back to look at Herring Beach at low tide, then drove to the nearby town of Alma to get ice, milk and (finally!) fuel for our stove. An ice cream cone revived my energy, so I added a short walk above Wolfe Beach from the covered bridge to the campground. We had sunshine most of the day, though the fog lingered in spots. 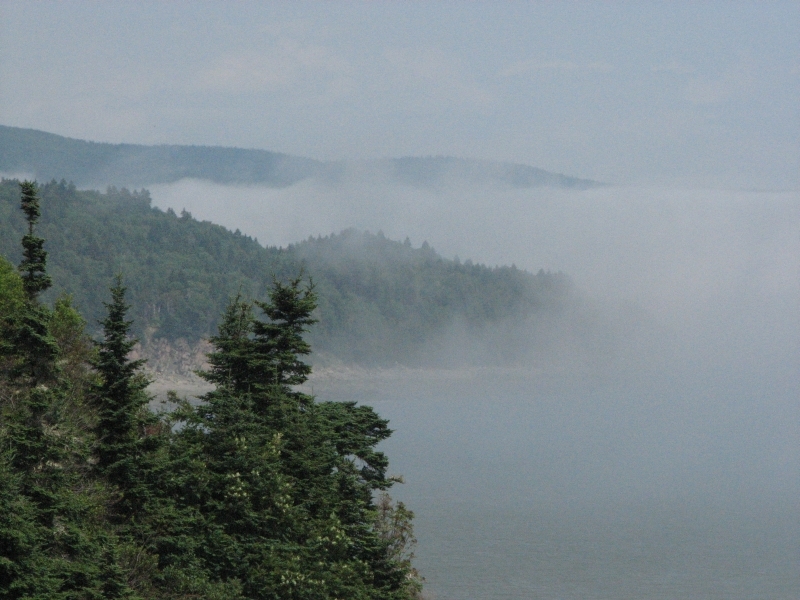 Blue ridges rose like islands above the thick white fog. Pretty! Jim: Finally - Canada. This has been on "The List" for a long time. Last time I was in this part of Canada was in 1977, and the snow was just wonderful (I was here to ski). This time I don't need (or want) the snow, but it looks like we'll get the "summertime equivalent" -- lots of rain and fog. It was a little strange to suddenly see road signs in both French and English. But you get used to that. 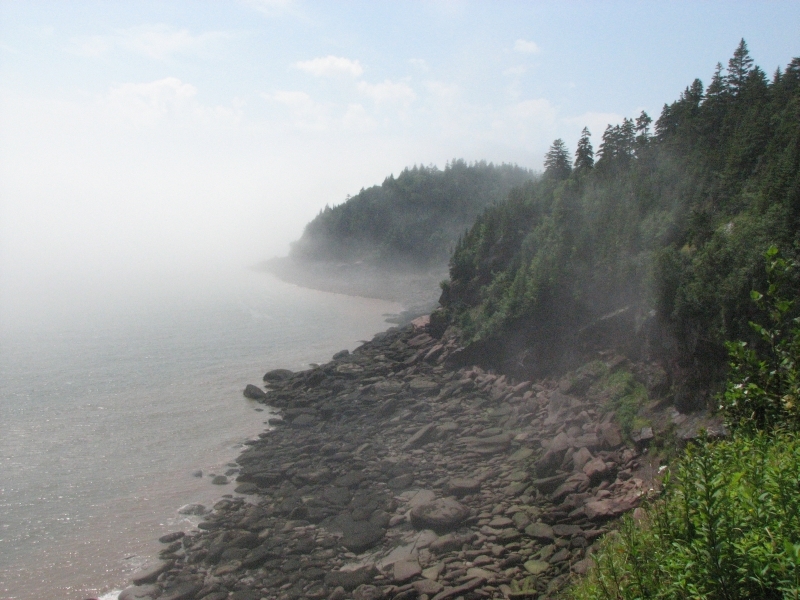 Fundy was a place that I've wanted to visit for a long, long time. Plans were to visit there back in 1992, after finishing the Appalachian Trail. But that didn't work out. 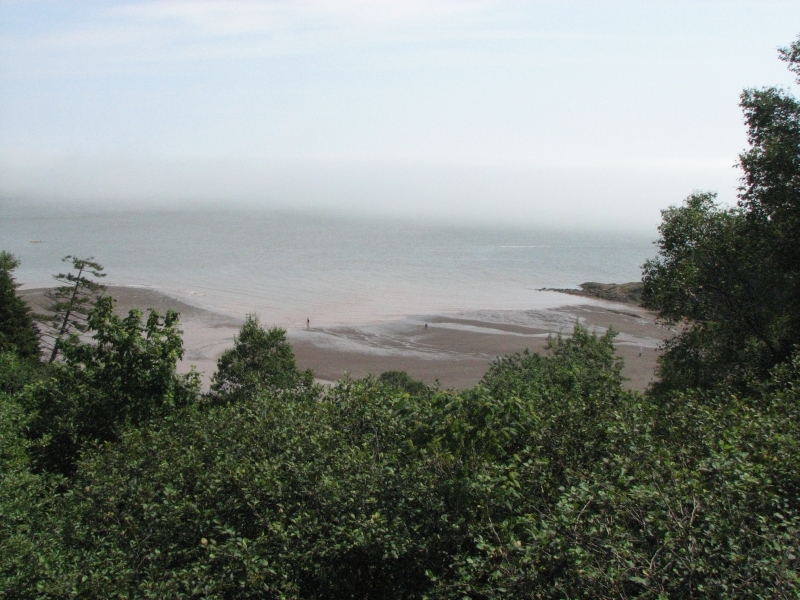 Fundy Bay was one of those places that we've heard and read about. It lived up to its reputation. 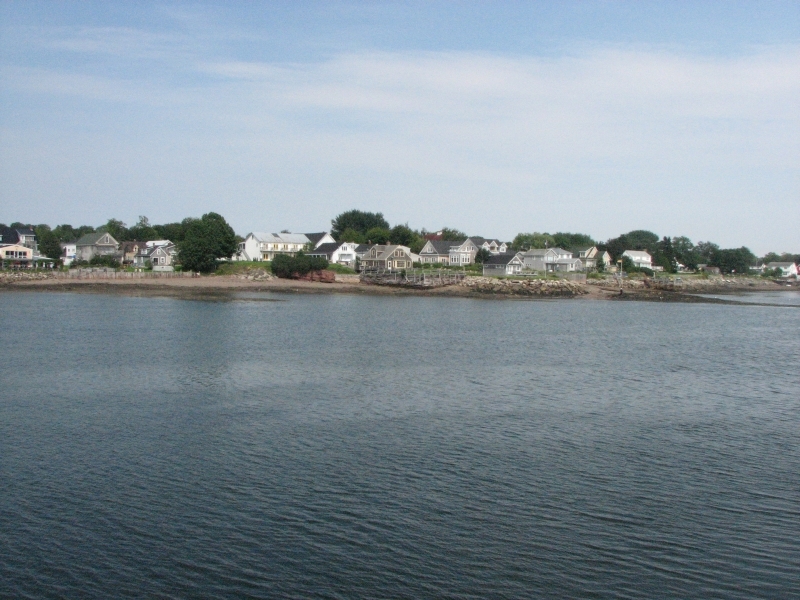 The tides are very large, the coastline is spectacular, the air is very wet and the people are very nice.